Looking for a quick, delightful holiday read? 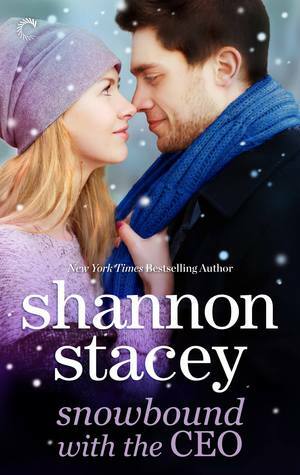 Then I recommend this festive romance from Shannon Stacey. I've really enjoyed her previous adult novels, even a summer novella that proved she could write an engaging story no matter its length. I sat down with a hot cup of cocoa on a cold, wintery night and devoured this novel -- it was the perfect read for such a moment. Adrian Blackstone is on a business trip with his assistant Rachel Carter at one of his cozy, delectable resorts in the snowy mountains of Vermont. The trip is meant to be short and sweet, landing a deal with a potential client's hotel renovations. But mother nature has different plans and decides to throw these two a twist that will leave them snowed in for the weekend with nothing more to do than give in to their over due sexual attraction. Without the office colleagues around to judge, both Adrian and Rachel give in to a passionate weekend, where no one will ever know. But what happens when the roads open back up and they must return to reality in the big city, surrounded by their work? The passion between Adrian and Rachel was HOT! Shannon Stacey did an excellent job of building it up in just the right amount of pages to make it believable. Then to follow it up with consequences that brought just enough drama to deepen the plot. I've come to expect happy endings with her novels and this one did not disappoint. It's a fast, festive read that held my interest and left me yearning for more holiday romances. I recommend grabbing this one to cozy up to and keep you warm. Novellas aren't my favorite, but I really liked this one. Especially the chemistry and banter between Rachel and Adrian. I thought they were so cute together! I read this one on Sunday. I have never read anything by Stacey before, and I was a little nervous to start off with a novella, because often I find novellas aren't that impressive. But I really liked this one, and want to try out her full-length novels now. This sounds like a cute, romantic little Christmas story! I think it would be fun to read this under a cozy blanket with a cup of hot cocoa and a few hours to kill.